MPG-o-Matic Pontiac G5 XFE Review Summary: The Pontiac G5 XFE is an eye-opening ride with a Jeckle and Hyde personality. After a 600 mile review, we’re impressed by the combination of highway gas mileage results, driveability, and value. The Pontiac G5 XFE Coupe competes with the Honda Civic, Ford Focus, VW Rabbit, and Mazda3, among others in the sportcompact market. The “extra fuel efficient” XFE is the most thrifty of the G5 range. Under the hood, the G5 XFE is fitted with 2.2 liter DOHC four cylinder engine, producing 148 horsepower (HP) and 152 foot pounds of torque. The official gas mileage estimates for the 2009 G5 XFE are 25 city/37 highway miles per gallon (MPG) with the 5-speed manual transmission. In over six hundred miles of driving, we squeaked by the official estimates with our Competition Yellow G5 XFE, scoring an average of 38.3 MPG on the Interstate highway, with 32.1 MPG combined. Test period temperatures ranged from the sixties through seventies, with freeway speeds between 60 and 65 miles per hour (MPH). Truth be told, the XFE must be driven with a light foot to achieve those numbers. Make no mistake about it, this car is fun to drive … and the more enthusiasm with which you drive, the more gas you’ll burn. Get on the throttle too enthusiastically and too often, and you’ll see those MPG numbers drop quickly. And there’s the rub. When it comes to performance and economy, this is a Jeckle and Hyde car, with split personalities. Under hard acceleration, the orange upshift light comes on at roughly 6,000 RPM. Under light acceleration, however, the upshift arrow illuminates a bit north of 2,000 RPM. The Drivers Information Center holds the keys to getting the best fuel economy out of the G5 XFE, with instant and average MPGs, oil life, tire pressure, distance, and range data. 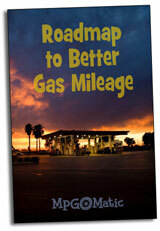 Keep it in Instant MPG mode and you’ll soon learn how to drive efficiently, with your foot literally off the gas. This is one economy car in which you’ll enjoy a well-informed run through the gears. And while it rides on low-rolling resistance tires, the G5 XFE handles admirably, as long as you drive it like a Pontiac, rather then a Porsche. The G5 XFE provides iPod integration via an in-dash input jack. There are two power plugs: one beneath the climate controls and one in the center console, between the shifter and handbrake. At just under $1000, our G5 XFE’s sun and sound package let the rays shine in through a generous sunroof and let the tunes flow through a rocking sound system with seven Pioneer speakers, including a mirror shaking trunk-mounted subwoofer. While the package might not win you many fans among your neighbors, it’s the E-ticket for the open road. We ended our week with the Pontiac G5 XFE liking the sporty coupe far more then we thought we would, despite its color and quirks. This car gets excellent highway mileage, when looking at the EPA specs, it’s about the best that we’ll see from an American car in 2009. All-in-all, the G5 XFE is a solid value and worthy of consideration. Assembly/Parts Content: The Pontiac G5 XFE is assembled in Lordstown, Ohio with a U.S./Canadian parts content of 71%. Of the foreign parts, 16% are manufactured in Mexico. The five-speed manual transmission is built in Italy. Be sure to check out our Pontiac G5 XFE Review.